We have all graduated (7-8 years ago!) from college, have moved our separate ways, married wonderful men (we’re praying for you, Mary! ), and had children. I just wanted to let you know, my college friends, how much I love you. I miss spending time with you but I’m so glad that we still keep in touch through phone calls and email. 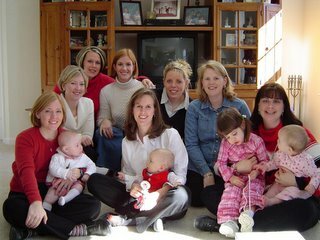 This is a picture from a baby shower in Atlanta given to me by my college roommates when I was pregnant with Andrew in Dec 2003. Pictured are Heather (with Will Ramsey), Bree, Malisa, Cory, Amy (with Dalton), Mary, me, and Libby (with Annie & Riley). Go VSU Blazers! Mitch and I had our sixth wedding anniversary two weeks ago but didn’t manage to “celebrate” it until this weekend. My mother drove 2.5 hrs to come spend time with Andrew while Mitch and I escaped to Atlanta for one night. It was a wonderful retreat! We stayed in midtown Atlanta on Peachtree St, right across from the Fox Theatre. While there, we took the Studio Tour inside the CNN Center/Newsrooms, saw Richard Petty as he signed his autograph for fans in Centennial Park, ate at The Cheesecake Factory and ESPN ZONE in Buckhead, walked around Lenox Square Mall, and then headed home. I really missed Andrew and was so glad to see him when I got home. We immediately sat down to a wonderful home-cooked meal upon our arrival that my mother prepared. Thanks, Mom! By the way, because some have been asking, here’s a picture taken of me today while in Atlanta. I’m 33 weeks pregnant with Luke….and counting. I love this picture of Mitch and Andrew peeking at each other through the stalks of corn and pumpkin stacks. We had fun today with Daddy and the weather was much more pleasant than on our first visit. Instead of choosing an orange pumpkin to bring home, Andrew went with a smaller white pumpkin this “go-round”. We visited the Pumpkin Patch with my local MOPS group today. 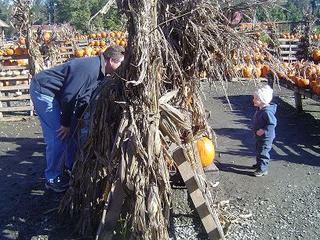 Andrew had a great time playing in the field of orange pumpkins and he loved getting lost in the maze of them. 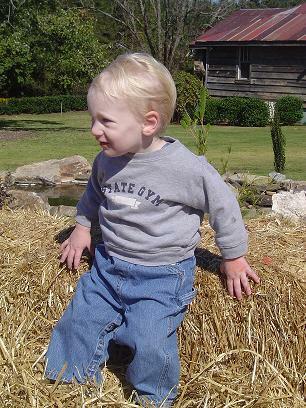 Of course, his favorite part of the day was riding on the back of the tractor during the hayride. We had so much fun that we’re gonna go back in two days with Daddy! We’ve been busy today! We spent a good part of the morning at a children’s expo in downtown Columbus which was really fun for all. There, Andrew rode the pirate ship, waved at everyone, laughed at the martial arts team, painted a pumpkin, and made friends with a lion…or at least someone hidden inside of a lion suit! 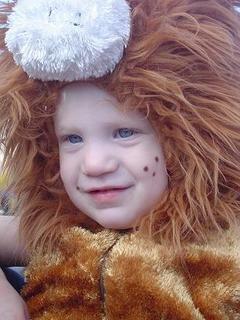 After naptime we all went to the Fall Festival at Andrew’s Preschool where he wore his lion outfit (see picture). He didn’t stay in it any longer than it took me to take some pictures. 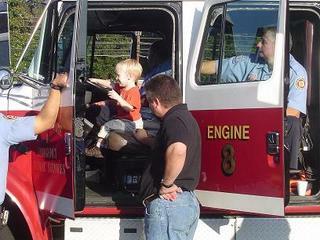 He was more interested in sitting in the fire engine or on the police motorcycle. 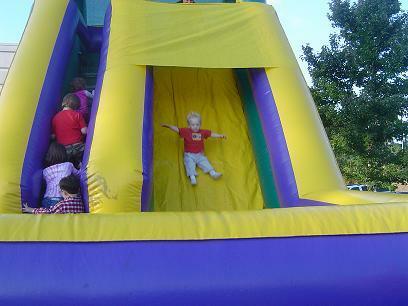 For the first time, Andrew slid down one of those huge inflated slides all by himself….and loved it! Thanks for letting me share and for visiting often to read about our family events! This photo needs no explanation. Andrew is roaring and ready to go after freshening up in his bath; but Dad…well, that’s a different story. Did I tell you that I was pregnant? Well, I KNOW I told that fact to the dentist office two months ago when I booked today’s cleaning appointment. Apparently, they either didn’t make a note of it or failed to ask the proper questions when I scheduled because, after signing in and waiting a few minutes this morning, I was asked, “Are you in your second trimester?”. 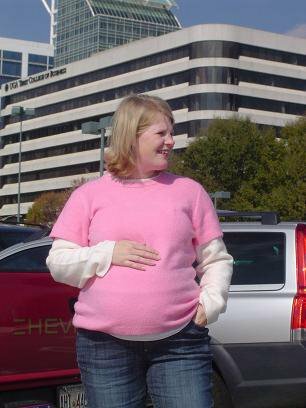 I could have laughed out loud because my belly doesn’t lie…any dummy could tell that I’m well into my third trimester. So, I answered, “No, I’m 31 weeks along & counting”. “Oh, that’s not good”, the hygenist said, “because we fear that you’ll be lacking enough oxygen when you’re laying back in the chair so you’ll need to reschedule.” Did I already mention I’ve waited two months for this appointment, even giving AFLAC their required waiting period for our dental plan? AHHHHHHH! So, I calmly rescheduled for February (I better not be pregnant at that appointment with a two month old at home!) and told them that I expect not only a cleaning but some dental work as well so I don’t have to wait another two months. So….. Since Mitch was already with Andrew at Burger King on the playground, I decided that I’d spend my “extra” hour going downtown to the tag office to renew my tag since it expires in two weeks. After struggling to find a parking space, going through the metal detectors and security, and standing in the beautiful concrete room with several others, I am told that no debit or credit cards are accepted…only checks. WHO CARRIES A CHECKBOOK WITH THEM ANYMORE? Maybe I’m just weird…..I don’t shop anywhere that doesn’t take a credit/debit card! I only write checks to put in the mail to pay for bills! I got nothing accomplished, it seems….well, I take that back….I did manage to stop at a roadside sale to purchase a $1.00 pumpkin for Andrew to take to Preschool and decorate on Wednesday. But, wait….he’s got a cold now so he probably won’t be going anyway…..figures.